Finding a reliable car rental in Sydney is now easy with CarHire.com.au. We are the leaders in car hire comparison and partners with some of the most trusted brands in Australia, including Europcar, Thrifty, Budget, Avis and Hertz so you are sure of getting a high-quality vehicle. Sydney is perhaps the most popular city in Australia that is why some visitors assume it is the capital. However, it is not! That honour goes to Canberra. The capital of New South Wales is often called "the Harbour City". It was the site of the first British colony in Australia and to this day boasts a proud heritage as well as a modern city-scape. As a major destination for immigrants to Australia, Sydney is one of the most multicultural cities in the world. Searching is easy - To get the savings and the rates you want, simply use our search engine to compare the rates of the top car hire companies in Sydney. Enjoy great rates - We offer the best prices on rental cars. Check out our Price Promise for more details. Book in an instant - Once you have selected your vehicle, you'll get a confirmation email or SMS to make sure your car hire is booked. Personal assistance - Got any questions? Our friendly customer care experts would love to assist you. Contact us by phone, email, or through live chat. Even if you hire a vehicle the city of Sydney is going to take you at least a few days of touring to fully appreciate. Expect to tack on a few more days to your trip for the iconic landmarks of New South Wales generally. The best way to get both your money's worth and your time's worth is to hire a car as this greatly expands your capacity for exploring the state and means you are not tied down to public transport schedules. If you also rent a GPS with your car hire, you will be all set to explore this vibrant and busy city and its picturesque surrounds. Day trip options include a drive out to The Blue Mountains, Jervis Bay or even to the nation's capital Canberra which is only 285 km away. Having a rental car at your disposal gives you the freedom to tackle not only Sydney but the entire state. Take some time out to get to know the locals too. There is plenty of variety to be found and a lot of fun to be had. Almost half of city residents are aged between 20 and 40, and over a quarter are students. So that is your first few days taken care of. The rest of your Sydney adventure is in your hands. If you do have any problems booking a cheap hire car for Sydney, we are always here to help you out. The Harbour, the Bridge and the Opera House are often the first choice of places to visit in Sydney. But there is so much more to this vibrant city! Check out the outdoor 'rock pools' dotted around the Northern Beach suburbs, dine at Cockle Bay Wharf in Darling Harbour, or search the historic lanes in the Rocks District. A hire car will give you the ability to travel where you want, at a time that suits you. Cheap car hire from CarHire.com.au equals total convenience! If proof is what you're after then here it is: Sydney is frequently ranked in the top ten of the highly respected Mercer Quality of Living Survey and the Economist's 'World's Most Liveable Cities' survey. More importantly, there are plenty of famous sights, plenty of sun and plenty of fine wines to be bought at places like Mosman Cellars. Just to get you started Carhire.com.au have compiled some ideas for your trip. It's always good to begin with the obvious so be certain to check out the Opera House (pretty hard to miss this one), Sydney Harbour Bridge. You could also consider planning your visit around fantastic events like Mardi Gras, New Year's Eve, Fashion Week or State of Origin rugby league games. Other top stops include Bondi Beach, Luna Park, Kings Cross, China Town, The Rocks, Darling Harbour, Taronga Park Zoo, Fox Studios, Sydney Tower and the Royal Randwick. 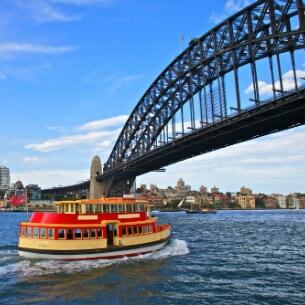 Consider ditching the rental car for a little while and catching the Manly ferry from Circular Quay. This will provide great views of the Sydney Opera House and Sydney Harbour Bridge. Manly offers a completely different slice of Sydney life. You can walk through the Manly 'Corso' to the ocean beach. Explore historic North Head with breathtaking Sydney Harbour views. Manly is not the only destination reached by ferry, Circular Quay is the starting point for many picturesque boat trips. Balmain and Darling Harbour are inner suburbs best reached by boat. Can't decide? See all the highlights with a boat tour. Taronga Zoo can be reached by ferry or road. It's a fun destination at any time, but for something extra special try the 'Roar and Snore' overnight accommodation package. This includes a gourmet buffet dinner followed by a two hour night time zoo safari and then an overnight stay in a safari-style tent. The morning provides a continental breakfast and behind the scenes tours before the zoo opens. With the freedom of a hire car, there are many fabulous regions of New South Wales that you can discover from Sydney. Many are an easy day trip away in your rental vehicle, such as the Blue Mountains and Katoomba. It's inland from Sydney itself, and Katoomba is the prime destination around the Blue Mountains National Park, just a 90 minute drive from the city. True to their name, you'll see that the distant mountains do indeed seem to be shrouded in a blue haze. Gourmets will love Newcastle and the Hunter Valley. The Hunter Region is famous for its wines and is a 90 minute drive north of Sydney. If you're up for a longer trip, Canberra, the capital of Australia, is also within driving distance, just three hours away. 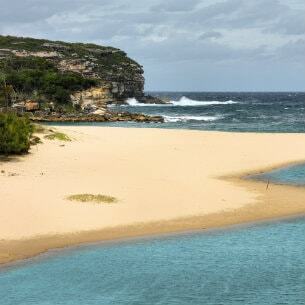 Sutherland Shire is a great destination if you've rented a car. 'The Shire' as it's known is just 25 kilometres south of the CBD and only 20 minutes from Sydney Airport. It delivers on every promise you've heard about Sydney: rich bushland, glorious beaches and beautiful waterways. There are plenty of experiences to be had and many of them - such as the Bundeena & Maianbar Art Trail every 1st Sunday of the month or a guided tour of ANSTO, Australia's only nuclear facility - are absolutely free of charge. Feedback: That was really clear and easy. Thank you!